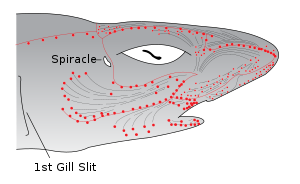 The ampullae of Lorenzini (sing. ampulla) are special sensing organs called electroreceptors, forming a network of jelly-filled pores. They are mostly discussed as being found in cartilaginous fish (sharks, rays, and chimaeras); however, they are also reported to be found in Chondrostei such as reedfish and sturgeon. Lungfish have also been reported to have them. Teleosts have re-evolved a different type of electroreceptors. They were first described by Stefano Lorenzini in 1678. These sensory organs help fish to sense electric fields in the water. Each ampulla consists of a jelly-filled canal opening to the surface by a pore in the skin and ending blindly in a cluster of small pockets full of special jelly. The ampullae are mostly clustered into groups inside the body, each cluster having ampullae connecting with different parts of the skin, but preserving a left-right symmetry. The canal lengths vary from animal to animal, but the distribution of the pores is generally specific to each species. The ampullae pores are plainly visible as dark spots in the skin. They provide fish with an additional sense capable of detecting electric and magnetic fields as well as temperature gradients. The ampullae detect electric fields in the water, or more precisely the potential difference between the voltage at the skin pore and the voltage at the base of the electroreceptor cells. A positive pore stimulus would decrease the rate of nerve activity coming from the electroreceptor cells, and a negative pore stimulus would increase the rate of nerve activity coming from the electroreceptor cells. Each ampulla contains a single layer of cells that contains electrically excitable receptor cells separated by supporting cells. The cells are connected by apical tight junctions so that no current leaks between the cells. The apical faces of the receptor cells have a small surface area with a high concentration of voltage dependent calcium channels and calcium activated potassium channels. Because the canal wall has a very high resistance, all of the voltage difference between the pore of the canal and the ampulla is dropped across the receptor epithelium which is about 50 microns thick. Because the basal membranes of the receptor cells have a lower resistance, most of the voltage is dropped across the apical faces which are excitable and are poised at threshold. Inward calcium current across the receptor cells depolarizes the basal faces causing presynaptic calcium release and release of excitatory transmitter onto the afferent nerve fibers. One of the first descriptions of calcium activated potassium channels was based on studies of the ampulla of Lorenzini in the skate. Large conductance calcium activated potassium channels (BK channels) have recently been demonstrated in the ampulla by cloning. Sharks may be more sensitive to electric fields than any other animal, with a threshold of sensitivity as low as 5 nV/cm. That is 5/1,000,000,000 of a volt measured in a centimeter-long ampulla. All living creatures produce an electrical field by muscle contractions, and a shark may pick up weak electrical stimuli from the muscle contractions of animals, particularly prey. On the other hand, the electrochemical fields generated by paralyzed prey were sufficient to elicit a feeding attack from sharks and rays in experimental tanks; therefore muscle contractions are not necessary to attract the animals. Sharks and rays can locate prey buried in the sand, or DC electric dipoles that simulate the main feature of the electric field of a prey buried in the sand. Any moving conductor, such as sea water, induces an electric field when a magnetic field such as the Earth's is present. The electric fields induced in oceanic currents by the Earth's magnetic field are of the same order of magnitude as the electric fields that sharks and rays are capable of sensing. This could mean that sharks and rays can orient to the electric fields of oceanic currents, and use other sources of electric fields in the ocean for local orientation. Additionally, the electric field they induce in their bodies when swimming in the magnetic field of the Earth may enable them to sense their magnetic heading. Behavioral studies have also provided evidence that sharks can detect changes in the geomagnetic field. In one experiment, sandbar sharks and scalloped hammerhead sharks were conditioned to associate a food reward with an artificial magnetic field. When the food reward was removed, the sharks continued to show a marked difference in behavior when the magnetic field was turned on as compared to when it was off. Early in the 20th century, the purpose of the ampullae was not clearly understood, and electrophysiological experiments suggested a sensibility to temperature, mechanical pressure and possibly salinity. It was not until 1960 that the ampullae were clearly identified as specialized receptor organs for sensing electric fields. The ampullae may also allow the shark to detect changes in water temperature. Each ampulla is a bundle of sensory cells containing multiple nerve fibres. These fibres are enclosed in a gel-filled tubule which has a direct opening to the surface through a pore. The gel is a glycoprotein based substance with the same resistivity as seawater, and it has electrical properties similar to a semiconductor. This has been suggested as a mechanism by which temperature changes are transduced into an electrical signal that the shark may use to detect temperature gradients, although it is a subject of debate in scientific literature. ^ a b Roth A, Tscharntke H (October 1976). "Ultrastructure of the ampullary electroreceptors in lungfish and Brachiopterygii". Cell Tissue Res. 173 (1): 95–108. doi:10.1007/bf00219268. PMID 991235. ^ a b Gibbs MA, Northcutt RG (2004). "Development of the lateral line system in the shovelnose sturgeon". Brain Behav. Evol. 64 (2): 70–84. doi:10.1159/000079117. PMID 15205543. ^ Clusin, WT; Bennett, MV (February 1977). "Calcium-activated conductance in skate electroreceptors: current clamp experiments". The Journal of General Physiology. 69 (2): 121–43. doi:10.1085/jgp.69.2.121. PMC 2215012. PMID 190338. ^ Fields, R. Douglas (August 2007). "The Shark's Electric Sense" (PDF). Scientific American. Retrieved 2 December 2013. ^ Meyer, Carl G.; Holland, Kim N.; Papastamatiou, Yannis P. (2005). "Sharks can detect changes in the geomagnetic field". Journal of the Royal Society Interface. 2 (2): 129–130. doi:10.1098/rsif.2004.0021. PMC 1578252. PMID 16849172. ^ Murray RW (1960). "The Response of the Ampullae of Lorenzini of Elasmobranchs to Mechanical Stimulation". J Exp Biol. 37: 417–424. ^ Murray RW (1960). "Electrical sensitivity of the ampullae of Lorenzini". Nature. 187 (4741): 957. doi:10.1038/187957a0. ^ Brown BR (2003). "Sensing temperature without ion channels". Nature. 421 (6922): 495. doi:10.1038/421495a. PMID 12556879. ^ Fields, RD, Fields, KD, Fields, MC (2007). "Semiconductor gel in shark sense organs?". Neurosci. Lett. 426 (3): 166–170. doi:10.1016/j.neulet.2007.08.064. PMC 2211453. PMID 17904741. ^ Brown BR (2010). "Temperature response in electrosensors and thermal voltages in electrolytes". J Biol Phys. 36 (2): 121–134. doi:10.1007/s10867-009-9174-8. PMC 2825305. ^ Erik E. Josberger; Pegah Hassanzadeh; Yingxin Deng; Joel Sohn; Michael J. Rego; Chris T. Amemiya; Marco Rolandi (13 May 2016). "Proton conductivity in ampullae of Lorenzini jelly". Science Advances. 2 (5): e1600112. doi:10.1126/sciadv.1600112. PMC 4928922.